"It isn't wrong to be alive, Sassenach." Let's have some whisky for our misplaced highlander friends. Droughtlander is over. The premiere was bookended with the deaths of two Scottish companions. And it felt very deliberately ominous. Like hey, we aren't in Scotland anymore and everyone needs to figure out what that means for the future. A man's word doesn't mean as much. Stability is fleeting at best. Stay on your toes, Frasers. Is it the writing? The acting? The rich source material? Genuine chemistry between the actors? More than likely a combination of it all complete with start alignment and luck. 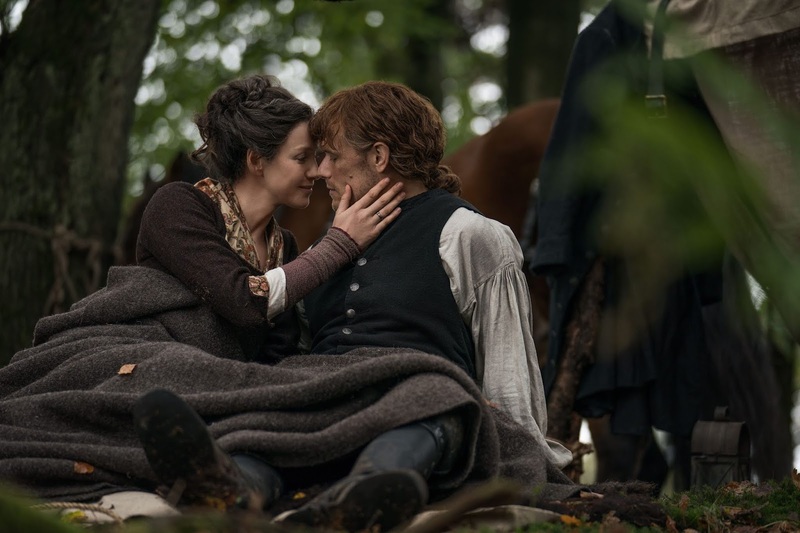 It's never overly complicated to comprehend how Claire could want to be with Jamie. She had to give up so much comfort, ease of living, material possessions– a roof over her head for crying out loud, not to mention her daughter in order to come back to him. And even through my cynical colored glasses, I can still believe she'd do it and understand why. With so much chaos, it's reassuring to see these soulmates be a focal point of calm for their little family. They've always been incredibly bonded and it's nice to see that 20 years apart did nothing to weaken that. From camping in the woods and chatting about philosophy to the intimacy they shared to the beautiful medical box gift, the heart and soul of this show are these partners. Jamie and Ian are both sexual assault survivors. I don't think I've ever seen a scene between two sexual assault survivors on television before. Much less one that was so endearing. It was sweet hearing Jamie try to comfort his nephew with almost identical words that Claire had said to him. It was also grounding and realistic that he would've learned how to see Ian through this panic attack by remembering what had helped himself in those situations. The whole thing was really well done. And then there is Stephen Bonnet – he's being toted as the new Black Jack Randall, right?? The ever-present threat. Well... okay, okay let's start by admitting that ending was horrifying. Absolutely horrifying. Losing Lesley, all of their financial stability and the beloved lallybrock ring were outright painful. And seeing Bonnet so frivolously slit someone's throat (as easily as he forged connections and obtained trust earlier in the hour) then fly right into such a rage did a lot in showing us what evil he is capable of. And if I know Outlander, we aren't done with this character. But Jamie and Claire are certainly not going to trust him again or let him off the hook. As far as we know, he isn't the greatgreatgreat grandfather of any of Claire's friends in the future. So how will he ever get anywhere near them ever again? There has to be more to him than what we've seen for Jamie to allow him the opportunity to make more trouble for his family. I trust that TPTB wouldn't expect us to accept a half-cocked villain so I'm probably right in assuming its going to get much worse. Do I have to rate these? Does anyone even care. Ah, I would say 4 out of 4 microscopes. I liked it a lot and for a premiere it ticked all of my personal boxes. But I reserve the right to give an episode that's even better a lower rating in the future. Jamie: "It's not your fault, lad. You did what you must, and survived. That's all that matters." Stephen Bonnet: "I won't bother you again. You have my word." Jamie: "When my body dies, my soul will be yours." Jamie: "Nothing is lost, Sassenach. Only changed." Claire: "That's the first law of thermodynamics." These two and their romantic banter! "There is the law, and there is what is done." Jamie: "You're thinking so loudly, I can hear you from here." Jamie: "Bees that have honey in their mouth have a sting in their tail." Jamie: "24 years ago I married you, Sassenach. I hope I haven't ever given you case to regret it." Claire: "Not for a single day." Jamie sort of broke my heart lamenting that he's never been able to give Claire all the finer things he wishes he could. But Claire is a healer and fixed me right up by telling him she has all that she needs. Wow. That's love, guys. It was a little on the nose that she lost her wedding ring only a few hours later but I'm not in the mood to be picky. Caitriona Balfe gets my gold acting star for the terror that played across her face at the end. Wow. She didn't look defiant. Or angry. She looked scared. With all the bad she's seen over the years, it felt almost clairvoyant that she knew this was the man that was going to violate her body. It was one of the least graphic ways she could been violated but the anguish of it all was palpable. There's been a lot of chatter and some outrage at the song choice for the end. I can only say that overlaying the horrific events with such a hopeful song was evocative. And I think they were doing much the same thing throughout the hour just with visuals and ideas instead of music. The views were majestic, even though they had just buried a dear friend. It's a land of practically immeasurable opportunity, unless you're a Native American or a slave or too poor. The song falls in line with those sentiments. Was anyone talking about the jewels in the wagon before they knew Stephen Bonnet had hitched a ride? Could Hayes have told him? The pirates seemed to be looking for them specifically. Also, they were pirates right? Even though there were no passwords, patches or peg legs. That was made clear. I think. Fergus and Marsali were practically not in this episode. Unacceptable. Fergus is a treasure and I need more of him. Hopefully their new baby brings them closer to his adopted parents. There was some weirdly obvious greenscreen stuff that was hard to ignore but I'm really going to try. Are seasons two and three going to get reviewed? lisa, how about a maybe? :) We usually do try to review all of them, if we can. We'll have to see. I'd love to say yes but don't hold me to it! !